When the toy army men rappelled from the ceiling to mark the end of Disney’s D23 Expo Animation and Pixar panel, it looked like an invasion. It sort of had been. An invasion of clips, stars and news from the upcoming slate of the company’s bread and butter genre. Zootopia, Gigantic, Moana, Inside Out, The Good Dinosaur, Finding Dory, Coco and Toy Story 4 were all represented on the panel, making up the next three or so years of films being released both by Disney Animation Studios and Pixar. The biggest news, outside of the reveal of Gigantic, was about Toy Story 4. 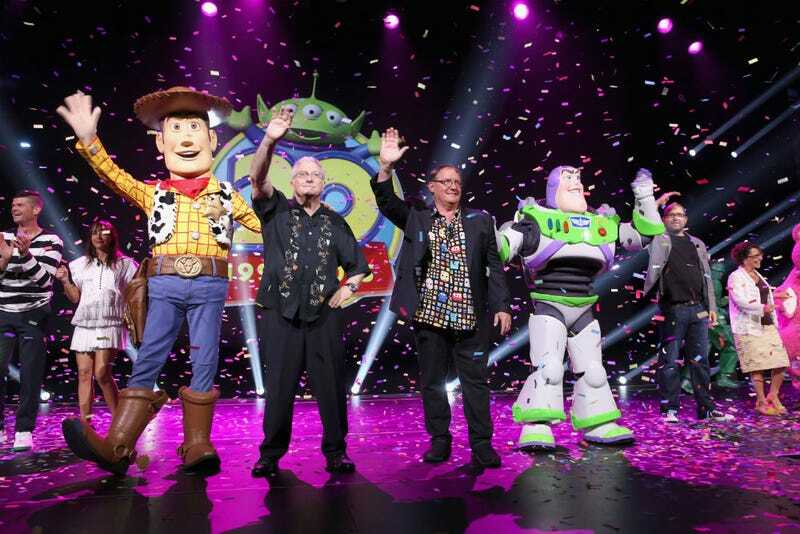 It’s a film Disney Chief Creative Office and director John Lasseter (seen above with Randy Newman) promised would never happen after the ultra-successful first trilogy, unless there was an idea good enough. We didn’t know what that idea was until today, and it’s this: A love story between Woody and Bo Peep. Bo is missing from Toy Story 3, written out in a throwaway line, and Toy Story 4 will see Buzz Lightyear and Woody go on an adventure to find the love of Woody’s life. Toy Story 4 will be released June 16, 2017. Another big reveal was that a long rumored Pixar film based on the Day of the Dead and directed by Lee Unkrich (Toy Story 3, seen above) now has a name. The name is Coco, based on one of the film’s main characters. Unkrich showed an internal test he and his team made to show the look of the film, which is set in Mexico during the Day of the Dead celebration. There, a young boy named Miguel will uncover a generations-old mystery and change his fate. What that means may have been revealed in the footage, which started on a calm Mexican night and then morphed into a surrealist celebration featuring skeletons jumping around, juggling heads, exchanging ribcages, playing in mariachi bands. And just then, it’s revealed one of these skeletons isn’t dead at all: It’s Miguel. The film doesn’t have a release date except Fall 2017. Disney also rolled out the big stars for their presentation. Dwayne Johnson was there to talk about Moana, the South Pacific-based mythology musical about a young girl who teams up with a legendary demi-god named Maui (Johnson) to try and figure out why people have stopped exploring. Johnson had the crowd on their feet, even before they showed an absolutely beautiful clip from the film. It featured a young Moana interacting with the ocean, who itself is a character in the film. Think The Abyss, but kinder and more massive, as the water played with the little girl and made a new friend. The Moana presentation ended with a performance by Opetaia Foa’i, who will be doing the film’s music along with Mark Mancina and Lin-Manuel Miranda. Moana opens November 23, 2016. The other major star to show up at the D23 Expo was Ellen DeGeneres. She was there for Finding Dory, the film she herself basically willed into existence. Director Andrew Stanton explained he never thought they’d do a sequel to Finding Nemo until he realized the story of Dory left something to be desired. This film will be about her finding her family, who may or may not be in a Marine Life Institute in Northern California. There’s that “finding,” as well as finding who Dory is, and how her flaws make her unique. Several other members of the cast were brought out too, including Ed O’Neill (who voices Hank the octopus, seen above), Ty Burrell (Bailey the Beluga Whale) and Kaitlin Olson (Destiny the Whale Shark). Finding Dory opens June 17, 2016. Clip of the day had to go to Zootopia, Disney’s next animated film which hits theaters March 4, 2016. The film continues Disney’s long tradition of talking animals who walk and dress like humans, except this time it’s been updated for modern audiences. Ginnifer Goodwin (see above with the film’s directors and producer) voices the film’s star, Judy Hopps, a bunny cop in the city of Zootopia. Judy is forced to team up with a sly fox named Nick Wilde (Jason Bateman) to solve a missing persons case, and the clip they showed was completely brilliant. Nick takes Judy to the DMV (that’s Department of Mammal Vehicles) to run a license plate that’s important to the case. There, he says his friend “Flash” will be able to help out very quickly. When they walk in, though, Judy realizes that every employee at the DMV is a sloth. They are all so slow it’s ridiculous. And that balance of them needing the information quickly, with the animals who are deliberately slower than anything, makes for some really funny humor. I won’t spoil it here, but there’s no way this scene isn’t a highlight. The panel also included the brand new Inside Out short film, Riley’s First Date? (question mark deliberate) which will be on the Blu-ray this Fall. It’s wonderful. There was also an extended look at The Good Dinosaur, the next Pixar film will hits theaters in November. The new footage looked both emotional and majestic, but for some reason, just didn’t grab me. Still, The Good Dinosaur is Pixar and if this panel or their track record is any indication, it’s going to be worth checking out. We’ll have more from the D23 Expo all weekend.